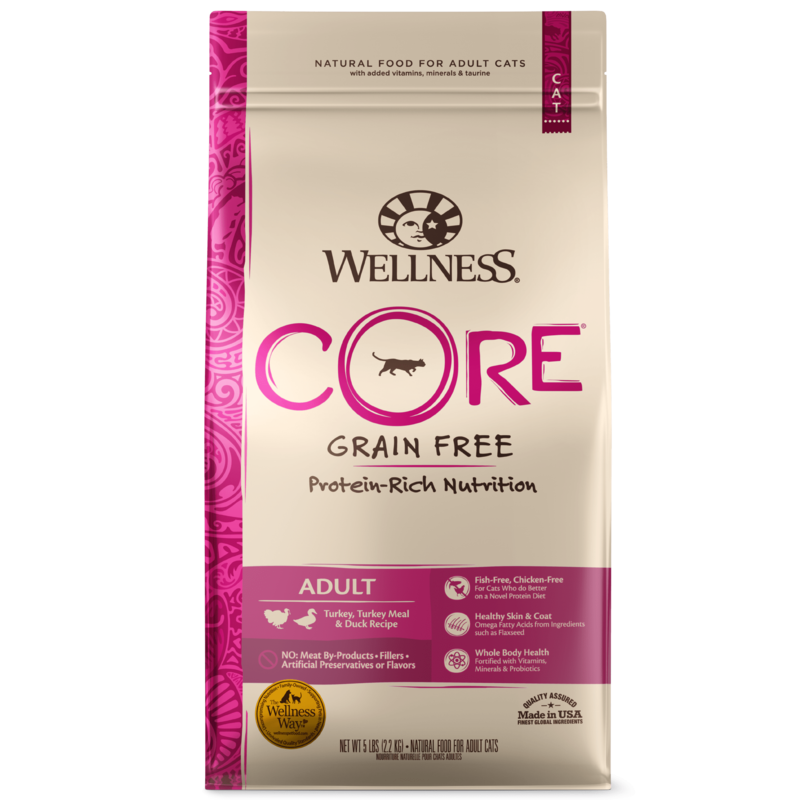 Wellness® Canned Chicken & Herring Recipe provides two sources of high quality protein and essential fatty acids, made with chicken and fish free of added growth hormones and steroids. We use herring as a source of protein and long chain Omega 3 fatty acids which are critical for healthy skin and coat, proper body function and enhanced learning. 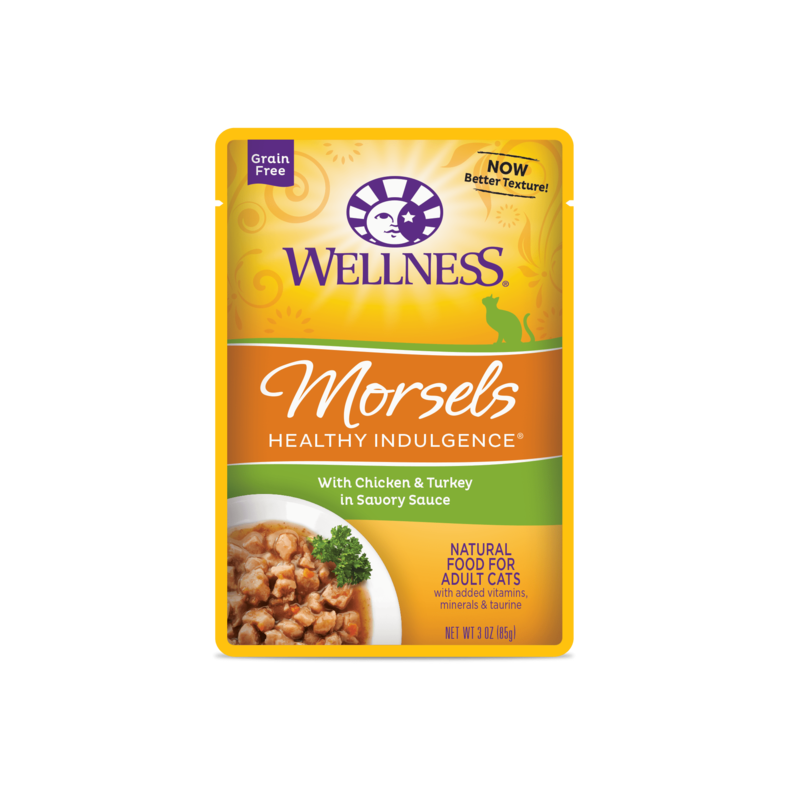 High quality chicken provides a delicious, digestible protein source. Chicken, Chicken Liver, Whitefish, Chicken Broth, Herring, Carrots, Natural Chicken Flavor, Sweet Potatoes, Squash, Zucchini, Dicalcium Phosphate, Guar Gum, Cranberries, Blueberries, Carrageenan, Ground Flaxseed, Potassium Chloride, Taurine, Calcium Carbonate, Iron Proteinate (a source of Chelated Iron), Beta-Carotene, Zinc Proteinate (a source of Chelated Zinc), Vitamin E Supplement, Choline Chloride, Cobalt Proteinate (a source of Chelated Cobalt), Thiamine Mononitrate, Copper Proteinate (a source of Chelated Copper), Folic Acid, Manganese Proteinate (a source of Chelated Manganese), Niacin, d-Calcium Pantothenate, Sodium Selenite, Vitamin D-3 Supplement, Pyridoxine Hydrochloride, Riboflavin Supplement, Vitamin A Supplement, Vitamin B-12 Supplement, Potassium Iodide, Biotin. 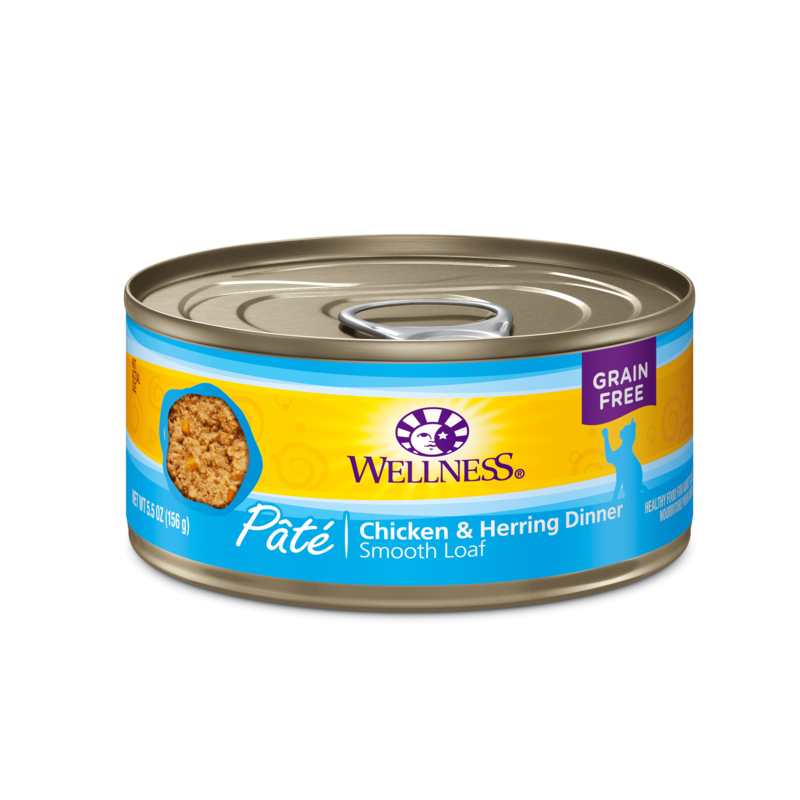 Wellness® Canned Chicken & Herring Recipe is formulated to meet the nutritional levels established by the AAFCO Cat Food Nutrition Profiles for maintenance.